Manatees, an endangered sea mammal, have been suffering off the east and west coast of Florida. On the east coast, there were unexplainable deaths. Now, the animals on the opposite coast are suffering from digesting a toxic algae. While this bloom appears each year, it has hit particularly strong recently. In 2012, 151 of the mammals were killed. In 2013, 241 have died so far. 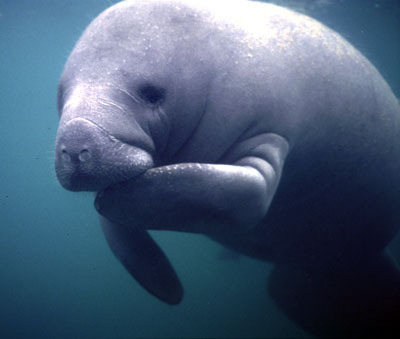 The Florida Manatee population decreased by over 200 animals due to toxins in the coastal waters. Photo from beachchairscientist.com. Experts do not know why the bloom has been so hard this year. Dr. Martine DeWit, a veterinarian from Florida’s Fish and Wildlife Conservation Commission, said the past windless winter may have helped the algae live longer than usual. Manatees are not the only creatures affected by this toxin. Other sea life is suffering and humans could be affected when it blows into the air when waves break. While the population has slowly been making a comeback over the past few years, this recent impact has hit hard. The state Fish and Wildlife Research Institute expect the number of infected and killed manatees to continue rising. The good news is that the algae had dissipated in mid-March. However, the deaths will probably continue for a few months as remnants of the algae float in the waters and cling to sea grasses.